When CJ and I are riding (or walking) in sync, is it a result of unrelated actions occurring together by chance? Or is it a result of cause and effect? If you’re a rider, the answer to that question may seem obvious; when you’re in sync with your horse, it’s a result of your ability to communicate with the horse through physical, mental and emotional cues. If you’re a great rider, the cues are so subtle they’re not noticeable to a casual observer, and barely noticeable to an expert observer, like the judge in a horse show. For example, say you’re riding along a trail and a fox darts across your path. You might recognize the fox is not a threat, but your ride may not. If your horse starts to freak out, the more you remain calm and in control, the more likely your horse will do the same. 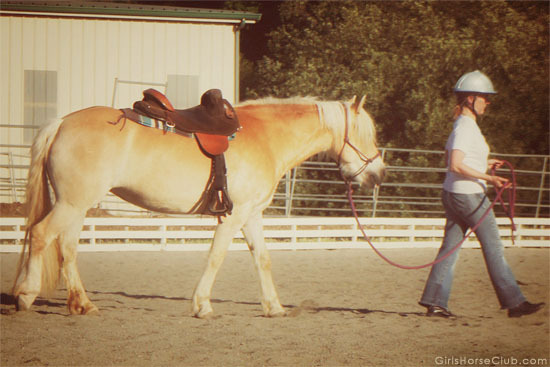 Of course, you have to be a confident rider to remain calm if your horse starts to freak, or at least be able to “fake it ‘til you make it.” If you let your own fears and insecurities will take over, your horse is likely to follow your lead. So in answer to my own question, I’d say the photo above is a primarily a result of cause and effect. If it were up to CJ, she’d be in her paddock finishing dinner. I’m the one who put a rope halter on her head, a saddle on her back and led her out to the arena for a warmup. (And I wouldn’t even let her graze the sweet grass outside the arena — what a meanie!) CJ is a lovely Haflinger mare who occasionally shows her mare-ishness, but in general she’s a good sport who follows my lead, and if my cues are clear we’re moving along in sync. Tell me — can you think of examples of synchronicity and/or causality in your horsey experiences? CJ seems like a really cute horse. I liked that article. And yes, I can tell you of examples of synchronicity in my horse life. When I’m leading a horse, and it can be pretty much any horse, I can glance down and almost all the time, our strides match. 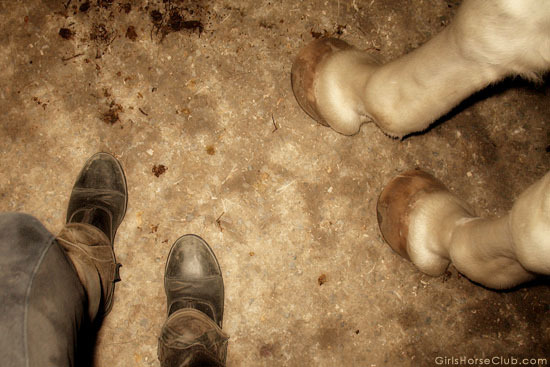 Whether it’s my own mare, my great big warmblood lesson horse, or my friend’s little pony. I think it’s because both horse and horseperson should be walking at the same speed and paces. There’s also the feeling of knowing exactly what your horse is thinking. It seems like you could put their thoughts into words, and you flow together, whether walking or riding. It is a magical thing when it occurs. This is so interesting, LeadMare. I think it just goes to show how interconnected we are to our horses. It takes a very observant rider to notice the subtle synchronicity between she and her horse — showmanship is essentially a test on just how “in-sync” a horse/rider combo can be (among other things). Thanks for your comments HorsesForever and Julia! I hope you’re having a fun summer with plenty of time around horses. Lol, yes! My horse I ride, Major, must be some kind of mind reader or something, because when were riding, sometimes I’ll bob my head to the imaginary music in my head (lol yeah, I know, I’m a music person :p) and I’ll look down and his is bobbing, too!! It’s kinda funny!